The great myth of Calgary is one of big open spaces that breed big ideas, fed by a relentless entrepreneurial spirit, but is that the reality? Somewhere in the ether between open sky and concrete, Calgary’s bold aspirations collide with an inbred conservatism that stops and asks: Yes, but how much does it cost? It’s a question that litters our history and, in the case of Stephanie White’s book Unbuilt Calgary , our (un)constructed landscape. The title of the book is self-explanatory. 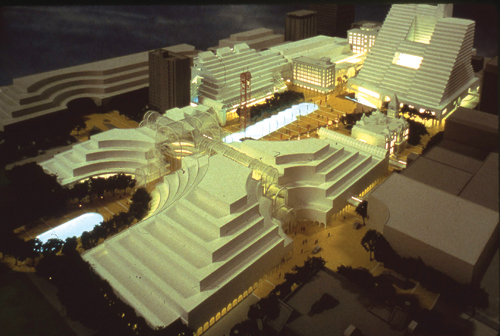 White examined projects from the archives that, for one reason or another, were never built. From grand schemes, including the 1978 civic centre plan that was defeated in a city-wide referendum, and the VIA Rail terminal along Ninth Avenue, to the little details, including an LRT bridge over Fish Creek or an earth-sheltered house that was almost built into a Calgary hillside. It’s a story of booms and busts. Of grand ideas unfulfilled, of disasters averted and of defining moments in our design history lost. For White, however, it’s the things that were built, or torn down in our ever-constant cycle of creation and destruction, that’s most telling about this city. The levelling of what already existed downtown to make way for the rise of the great corporate towers, the push for transportation so that people can escape those towers, and the city hall that turned its back on the East Village before it became a blank canvas awaiting new condos. As with any discussion involving Calgary’s development and growth, it starts with a line — the hard line between prairie and city. Everyone has at least one story related to it. For me, it was my father, who lived down the hill from what would become Elboya, then the city’s southern edge and now decidedly in the hole of Calgary’s expanding doughnut. Later, my friend lived in the last row of housing in Shawnessy. As Macleod Trail continues to stretch south, far beyond the original grid laid out by the Canadian Pacific Railway, the neighbourhoods have changed, the distance has increased, but there are some constants, even in a city like Calgary. While the CP grids still exist downtown, what’s most interesting is the creation of space in the city, heavily leaning to corporate places, as opposed to great public ones. It used to be that the centre of Calgary was at the CP station just east of the Palliser Hotel. Open to Ninth Avenue S.W., the station was a fundamental reason for the city’s expansion and a justifiably important location. It was a company town, at least for a little while, and it’s never outgrown that beginning. Calgary doesn’t have great civic spaces, preferring instead to build gleaming towers and privatized squares. The University of Calgary is another example of space that doesn’t allow for the unwashed masses to gather. White recounts in her book how the original design was overridden, leading to the almost arbitrary configuration of the campus, with no central meeting ground. Something that might have been inspired by the student protests sweeping the western world at the time. Stepping away from the campus, White was researching her book when she came across a photo of Stephen Avenue mall in its early days. In it, a policeman clears hippies from wide, grass-filled planters that once lined the avenue. “I mean, the picture I saw was policemen moving hippies on. That was the caption to it. ‘Police oust hippies.’ And they were. You know, they were long-haired louts,” says White with a laugh. The planters were removed. The hippies, one can assume, were as well, and Calgary could breathe easy with one less gathering spot for ne’er-do-wells. It’s a fitting metaphor for the design of the city and its self-perception. As White says, there is a time-lag in Calgary’s aspirations and constructed environment, as tied to our social views of others as our design. There was the (thankfully unsuccessful) push to create a transportation parkway along the Bow River’s southern edge, filled with rail tracks and cars. It can be seen over and over again in Calgary’s development. Take the recent example of projects that were built — the Peace Bridge and the Bow. While both are welcome additions, they don’t really mark the city as a hot spot of cutting edge design. Calatrava has a bridge in just about every major city and Foster kind of mailed in his design for Calgary’s tallest tower. When White and others were bringing hot young architects to the city for lectures in the ’80s, it failed to capture the imagination of those who make the decisions and commission the work. It’s those missed opportunities that are the real unbuilt Calgary, the projects that don’t have any drawings, or plans — the ones that were never considered. While our constant game of catch-up certainly plays a role, there’s also the ever-present cycles of boom and bust, making Calgary a fairly unique canvas of ideas come and gone. Thomas Mawson’s plan to remake Calgary as the Vienna on the Bow — the only part of which was constructed was the Centre Street Bridge — was likely never going to happen, but Calgary’s first crash from its first boom ensured that it would be lost. In fact, the plans were literally lost until being rediscovered in an Eau Claire garage in 1977. There are the innovative condos-townhouse developments of the Beltline that became imposing towers with no street interaction. There was McIntyre Plaza along the C-Train tracks downtown that would have been the highest density tower at the time and opened up the avenue with a wide plaza. All lost to the inevitable busts. Currently it’s the East Village, sitting largely vacant, with considerable buy-in from the city, that awaits its fate amidst a global recession. But White argues that perhaps we’re harping at the wrong things. Perhaps we shouldn’t be throwing ourselves into an architectural arms race, or bemoaning grand plans that never came to pass. What she misses most is not the projects that were never completed, but the loss of our heritage spaces and the destruction of a lively downtown to make room for commerce and commerce only. There is also relief that some of the projects, or more specifically, the big plans, were not completed. There is a necessary tyranny to bold plans and great architectural statements. “What kind of a political democracy or totalitarian system would we be living in where such plans would actually come to pass? They would require massive expropriations and draconian rules to tell people what to do with their own little pieces of land. It could never happen,” says White. The great unbuilt city is missing out on the small things, rather than the large towers, the neighbourhoods and the plans. We may not ever be the architectural wonderland that so many hope for, and if White is right about the lacing of political oppression and grand design, we should be thankful for it. We get buildings. We’re too Canadian to ask for much more.